Our Urmston branch is located within the new Eden Square development on a high profile corner with Flixton Road. The new office offers a superb showcase for the properties we have for sale or rental. The Urmston branch is headed by Richard Antrobus, Managing Director, who has quickly established a reputation for offering a professional and friendly service within the area. The locally based team is both knowledgeable about the area and experienced in handling many property transactions utilisin Read full description...Our Urmston branch is located within the new Eden Square development on a high profile corner with Flixton Road. The new office offers a superb showcase for the properties we have for sale or rental. The Urmston branch is headed by Richard Antrobus, Managing Director, who has quickly established a reputation for offering a professional and friendly service within the area. The locally based team is both knowledgeable about the area and experienced in handling many property transactions utilising the latest computer systems and technology. Our attractive and welcoming office sets the benchmark for property services within the area, while the VitalSpace web site is reviewed daily to ensure the most up to date information is available 24 hours a day. We offer both a sales and rental service covering the following areas: Urmston, Stretford, Flixton, Davyhulme, Eccles and Partington, and we would be pleased to talk to you about your property in these areas. We offer a comprehensive rental service with a full property management department and would be happy to offer assistance on any property related issues. 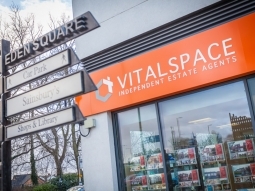 For a free valuation or property viewing, please call 0161 747 7807 or complete our 'contact us' form, and the VitalSpace team will be very happy to arrange an appointment for you. I have a completely managed service and the fees are very fair for the service delivered. Agents fees were where worth every penny. Checking with other agents, Vitalspace fees were average. More expensive then some agents but the quality of service I think warrants the price. The fees were the same as another agent who valued the property so I believe they are very fair. Very reasonable fees for the amount of work put in by the team. Very competitive, cheapest that I found. Fees are fair for the service you receive and the set fee makes things simple. There was no payment if the sale did not go through which saved any stress. Very Fair , for the service . Very surprised at the cost but not having sold a house before I had no idea what the cost would be. But all done and dusted. I was the buyer and had no fees from Vital Space. The agent fees were on par with other agents. Agents fees were too expensive.